Olivia Jane Mell as daughter Ellie (left) and Lynda DiVito as mom Katherine have the battle that switches their bodies. Center Repertory Company is presenting the 2016 musical iteration of the story by Mary Rodgers and Disney Films. 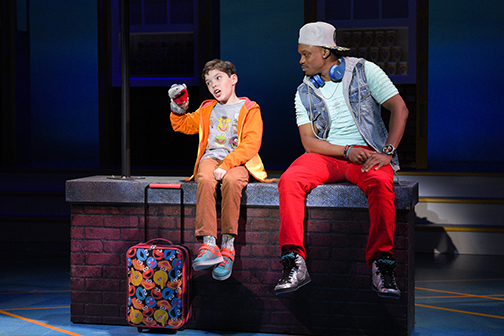 The result is lots of fun thanks to an outstanding production featuring a topnotch cast. In this version (unlike the films), the widowed mom, Katherine Blake (Lynda DiVito), is a caterer who’s going to cater her own wedding the next day. It’s no surprise that she’s uptight. Her daughter, Ellie (Olivia Jane Mell), isn’t helping much. When a prized hourglass splits in a tugging match between them, they suddenly find themselves occupying each other’s bodies but looking like their original selves. Hence it’s left to Ellie to take Katherine’s place and try to keep things running at home. Katherine must go to Ellie’s high school and confront her friends, rivals and teachers. Lots of laughs follow. One of the funniest moments comes when Katherine, acting like her daughter, tries to read her young son, Fletcher (Tyler Patrick Hennessy), a bedtime story but must hold the book far away because she’s farsighted. The hourglass has a twin, but Katherine sold it to an antique store that has closed. Therefore, as Ellie, she persuades her friends to go on a treasure hunt to find it in Chicago and undo the spell. Although it’s a fairy tale, the updated book by Bridget Carpenter has some serious aspects to go with all the amusement. Mainly they stem from the lessons that mother and daughter learn and that improve their relationship. The music by Tom Kitt, with lyrics by Brian Yorkey, is upbeat and fun. It’s enhanced by excellent singing plus the small pit orchestra led by musical director Daniel Feyer from the keyboard. Also noteworthy is the well-executed choreography by Jennifer Perry. Tyler Patrick Hennessy (left) is Fletcher and Dave J. Abrams is Adam. Director Jeff Collister has assembled an energetic, likeable cast. Besides the two principals and the remarkably poised young Hennessy as Fletcher, some of the more notable main characters are Katherine’s fiancé, Mike Riley (Noel Anthony); and Ellie’s boyfriend, Adam (Dave J. Abrams). Several ensemble members play multiple roles. An audience favorite is Katrina Lauren McGraw, especially as Ellie’s demanding gym teacher, but everyone else is worthy of applause, too. Production elements complement the show, especially the colorful costumes by Victoria Livingston-Hall. The attractive, flexible set is by Kelly James Tighe with lighting by Kurt Landisman and sound by Jeff Mockus. 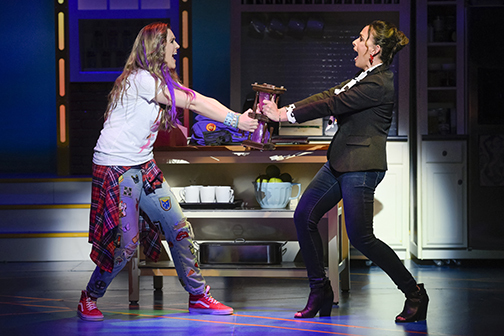 Running about two and a half hours with one intermission, family-friendly “Freaky Friday” will continue through June 30 at the Lesher Center for the Arts, 1601 Civic Drive, Walnut Creek.